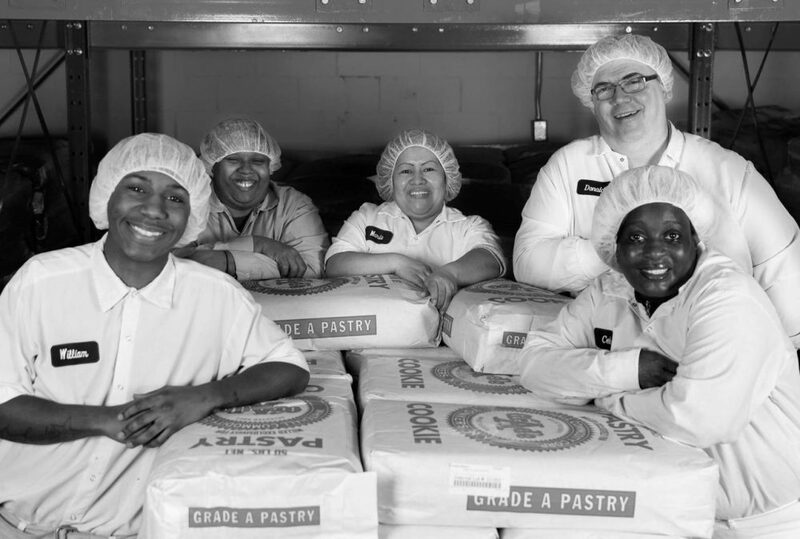 The open hiring policy at Greyston Bakery in Yonkers, N.Y., invites local residents to apply for jobs, regardless of their immigration status, whether they have criminal or drug records, or even prior work experience. It's all part of the company's social justice business model, based on the Buddhist philosophy of Bernie Glassman, who founded the industrial food facility in 1982. The model has proven successful for Greyston, which provides brownies for Ben & Jerry's ice cream, and also sells them at Whole Foods. As part of our series View From The Top, Here & Now's Robin Young speaks with Mike Brady, CEO and president of Greyston. He explains how a for-profit company with a non-profit arm can both be profitable and do good in the community. "We actually have a waiting list. ... When we have an opening available, people come through. We have a brief orientation program when we inform people what the job will be about, and then a lengthy 10-month apprentice program, where we provide people with a set of skills before they actually become formal members of Greyston, and then join our union." "It's part of our heritage, which was to give everyone a chance. We're not concerned about people's pasts. We don't want to judge what they've done in the past, but only think about what they can do in the future." "We don't think about it that way. We think about it in a way that whoever it is that's gonna be coming through those doors deserves the same opportunity as someone else. And to place judgement on that person because they might have been a felon would skew our opportunity to perhaps find a very good employee. So rather than trying to judge and say 'oh, this person has done this or that,' we have a process that once people are on board, if they can demonstrate they're gonna be a good employee and they can join and be effective with the other 99 team members, then we're happy to have them. "We should all care about the bottom line. This business practice does not have a negative approach on the bottom line. The costs that go into onboarding people through interviews and background checks is replaced by what we're trying to do in a different model. You had mentioned in your lead-in that we're working with Ben & Jerry's. And it's an amazing relationship and one that we're able to market and sell basically because we have a really engaging social justice program. Mike Brady, CEO and president of Greyston. He tweets @themikebrady. This segment aired on May 14, 2015.